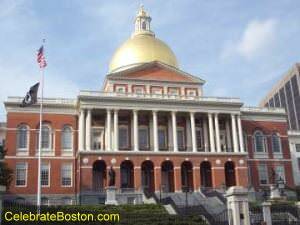 "The State House, or 'The Hub Of The Solar System' according to Oliver Wendell Holmes, is quite impressive. The building stands on the summit of Beacon Hill, on a lot which had been John Hancock's cow pasture. The cornerstone was laid in 1795, and the oration was delivered by Governor John Hancock. The customary Masonic ceremonies were conducted by Paul Revere, grand master. The south side was added in 1852, and the dome was gilded gold in 1906. The building was first occupied by the 'Great and General Court' in 1798, when the Old State House was abandoned. Charles Bulfinch was the designer, and is a fine example of Federalist Period architecture. Bronze statues of Horace Mann by Emma Stebbins, and of Daniel Webster by Hiram Powers, and two fountains, ornament the terrace in front of the building. The old front entrance is reached by succession of stone terraces from Beacon Street, and leads into the Doric Hall. The adjacent hall for many years contained the remnants of the flags carried by Massachusetts soldiers in the civil war. Thomas Ball's marble statue of Governor John Andrew is considered a great work of artistic merit; and Chantrey's statue of Washington, wrapped by a military cloak, should be noticed. In Doric Hall are also busts of Samuel Adams, Abraham Lincoln, Charles Sumner, and Henry Wilson. The Hall of Representatives, in the center of the building, is the largest room in the structure, and accommodates 500 people. Visitor's may be admitted to the gallery during the sessions. The ancient Sacred Cod still hangs over the visitors gallery, an emblem of the bygone importance of the cod to the State. The same fish hanged in the Old State House, but was taken down, and not restored until after the American Revolution was resolved. Next to the State House, until 1863, stood the home of Governor John Hancock, making this part of Beacon Street even more historic. A bronze plaque is mounted on a column at the old west gate, marking the location of the former entrance to the home.